Unchalli falls was on my target ever since school days (one of our staff was from Unchalli) but it took till 2014 for me to visit this place. 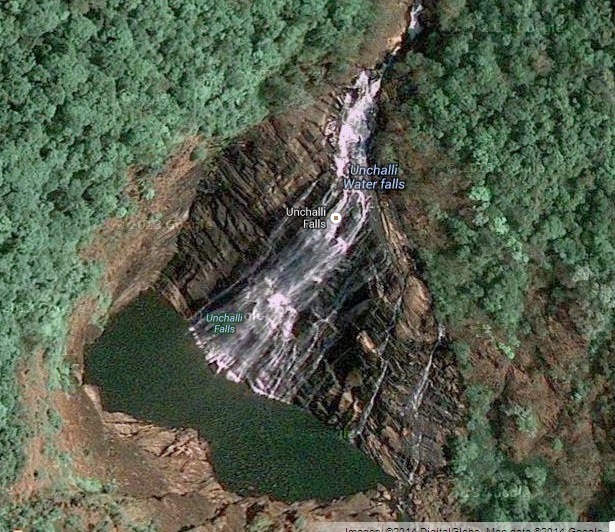 If you try to locate how to go to Unchalli falls on google maps, you will fail. Because the road till Unchalli falls is not recognized properly in the maps. Heggarane is the nearest village till which roads can be searched on google maps. Heggarane is 440 kms from Bengaluru, 35kms from Sirsi and 115 kms from Karwar. From Heggarane, Unchalli falls is another 7kms or so. Vehicles can go all the way till falls, except for last 1km which needs to be covered on foot. The drive till Heggarane was also enjoyable, with decent roads and nice corners. Enjoyed driving Ertiga through these corners. A viewpoint gives below view of the falls, those interested can take the steps down, to view the falls from the bottom and play in the waters. Being January, water levels were low. But I am told falls will have water all through the year. Seems to be a lovely place!! Nice shots of the falls.